The Church of the Holy Cross has two main streams of spiritual parents of Christian witnessing. (1) “Missionaries arrived in Hawaii from New England in 1820 in response to the earnest request of a young Hawaiian, Henry Opukahaia. The Hawaiian Evangelical Association (REA) was formed and many Congregational churches were established. (2) After the Japanese government lifted the ban on Christianity in 1873, missionaries from the United States went to Japan to establish churches and schools. 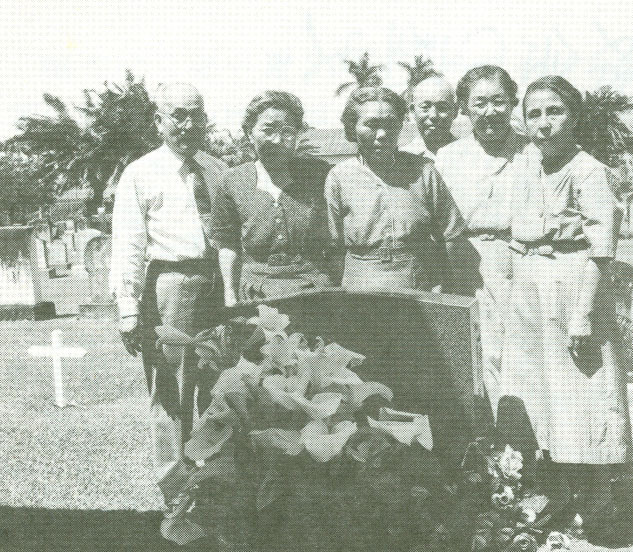 In 1888, the REA called Jiro Okabe, a young issei Congregationalist, to work among the Japanese immigrants on the island of Hawaii. Ordained in 1890, the Rev. 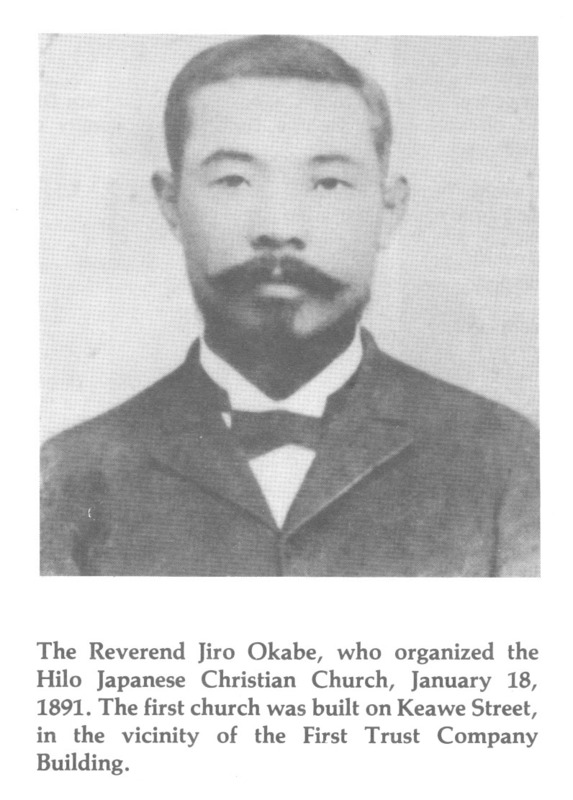 Okabe organized the Hilo Japanese Christian Church on January 18, 189l. He outlined his scope of work as evangelical, educational and benevolent. The new members contributed $15.00 for mission. The Rev. Okabe was transferred to Honolulu in 1893 and eight issei ministers followed from 1893 to 1946. 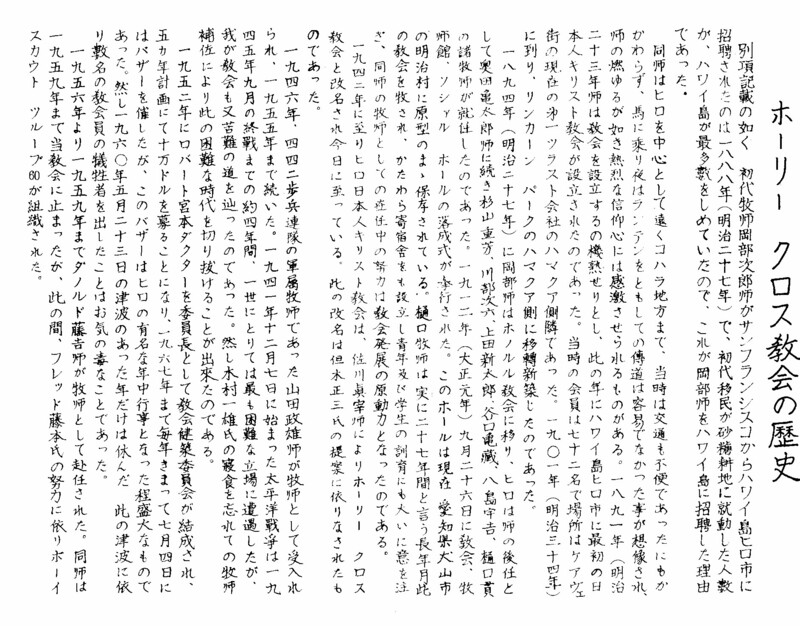 Adult English classes were held and many issei were converted to Christianity through such class contacts. A mission of the Japanese Christian Churches was to teach democracy to the adults and assimilate the young to the American way of life. The first English speaking nisei minister was called in 1946. The isseis were ministered by part-time issei ministers until 1982. 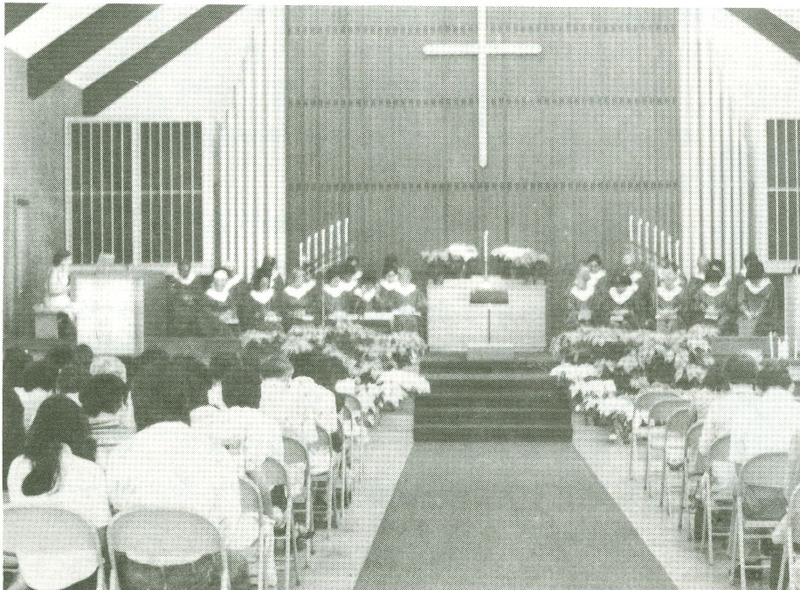 In 1984, arrangement was made for an issei minister from Makiki Christian Church to conduct services for the issei once a month. This was discontinued in 1992 due to the very small number of isseis. Along the way, membership has extended to other cultural and ethnic groups, expanding our church family. The first church building was erected on Keawe Street in 189l. It was relocated on the lot adjacent to Lincoln Park in 190 l. A new sanctuary was built in 1912. The first church building was used as a dormitory for ”unprotected women and school children”. In 1968, this building was reconstructed in its original form at the Meiji Mura Museum in Nagoya, Japan. A three acre property on Lanikaula Street was purchased in 1959. The parsonage was completed in 1960 and the educational/office/social hall building was dedicated on February 15, 1962. The social hall has been used as a sanctuary. Mortgage burning ceremony was held on May 17, 1970. A time capsule was deposited by the church bell in 1991 as part of the centennial celebration and it is to be opened in the year 204l. The church became self-supporting, no longer dependent on the REA, in 1919 and was incorporated in 1955. The name was changed to the Church of the Holy Cross in 1942, during World War II. Following the merger of the Congregational Christian Church and the Evangelical and Reformed Church in 1957, we became a part of the United Church of Christ. From the beginning, we always have had a democratic form of church government. As the years went by, the issei turned over the leadership of the church to the younger membership. The Church Council continues to be the executive body of the church. A mission statement was adopted in 1996. Today, many members are involved in the work of the boards (Christian Education, Deacons, Stewardship and Mission, and Trustees), as well as the Laymen’s Fellowship, Women’s Fellowship, Senior Ministry, International Young Adults Association, and other groups. Under the leadership of the Rev. Susumu Yamane, our members were instrumental in the establishment of Hospice of Hilo in 1982 and Hale Aloha 0 Hilo Habitat for Humanity in 1990. We have participated in many local, national, and global mission projects. A multi-purpose “Building of Faith” was added to our church campus in 2004 to serve our congregation and the larger community. Our sanctuary hosts Worship Services of Tongan, Pohnpeian, and Samoan churches. Church of the Holy Cross is a United Church of Christ congregation, welcoming all without discrimination.